Winter is soup time, and when I ran into mimolette, I could not resist. I had not seen Mimolette before in the US and I was so excited. I had planned to make a gratin, and a soup with it, but the cheese did not not make it to either dish. I just ate it all and in a very quick and fashionable manner. Mimolette is a French cheese made in Lille, the North of France. It’s also called “Boule de Lille“, it’s a cheese produced with cow milk, with a condensed raw flesh (pâte pressée). Its deep orange color comes from a natural coloring called “roucou” which is a plant used in some cheeses such as Gouda, Cheddar or Edam and used in Europe as food coloring. 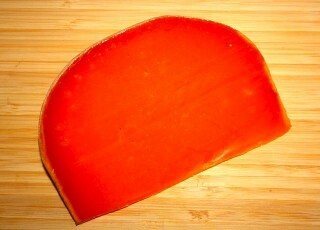 Mimolette‘s hard texture is similar to Dutch Gouda. The older it gets, the harder the texture becomes, and I really love extra old Mimolette, it tends to have a more pronounced character. I somehow love salty cheeses, they go perfectly well in soups, gratins, and enhance many dishes. 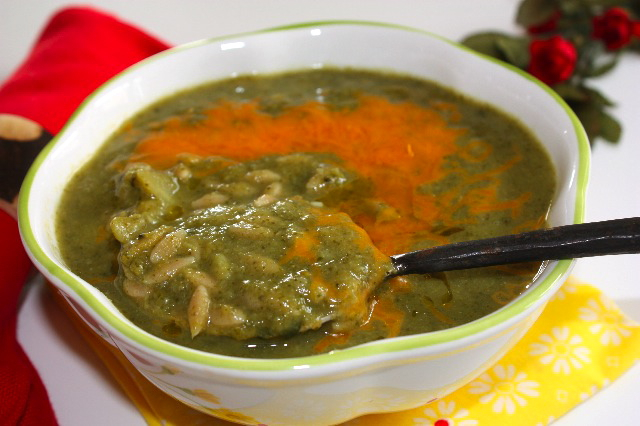 This soup made with three green vegetables is full of vitamins and flavors. When I make “creamy” and thick soups like this one, I like it served either with toasted bread or sometimes with small pasta cooked in the soup. You get a wholesome and wonderful meal. Risoni is the Italian name for “orzo”which in Italy is barley, so it can get confusing. My mom used to make soups when I was a child with risoni, it’s very common in Italy to use small pasta like this one or ditalini in soups. 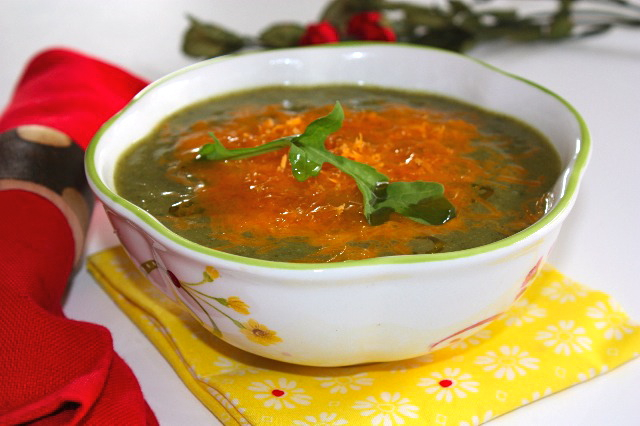 The other important ingredient in this soup is the garlic that adds a lot of character to the broth, it balances out the earthy flavors of the green vegetables. In a large pot, heat olive oil, add broccoli and leeks and cook for about 5 minutes until the vegetables are coated with olive oil. Add 3 garlic cloves, whole and peeled. Add broth. For broth quantity, it needs to cover vegetables to about 1 cm of liquid. Adjust with salt and pepper. Cook until the vegetables are cooked all the way through about 20-30 minutes. When vegetables are cooked add spinach leaves (if using baby spinach, no need to chop them, otherwise you will have to chop them roughly). Cook and extra 5-10 minutes. Add crushed garlic and cook an extra 5 minutes. Keep about two laddles of vegetables aside. Blend the rest in a blender into a smooth purée. Place the vegetables pieces back into the pot with the purée and place back on pot at low heat. When it starts boiling, add orzo, and stir well. Keep on stirring for a while to prevent pasta from sticking. If the consistency is too thick add a little broth. Cook until al dente and serve in bowls. Add 1 tbs of mimolette and sprinkle with olive oil. This entry was posted by silvia on December 16, 2009 at 6:42 pm, and is filed under Soups, Vegetarian - dairy. Follow any responses to this post through RSS 2.0.You can leave a response or trackback from your own site. I never had mimolette before. I think I have seen it but this is an interesting soup. I seldom have soup with cheese! Well this is another cheese I will need to keep a look out for. I am sure it was amazing in this soup!! !I hope you and your family have a wonderful and joyous holiday season. The photos are super, the colors just pop. Anything with all this color must be great. I love that you say you ate the cheese in a “quick and fashionable” manner. If anyone could eat cheese fashionably, I believe you could do it! It looks delicious, and healthy too. Vibrant color — perfect for the holidays! A beautiful soup. I don’t think we’ve ever cooked with mimolette, so your recipe looks really interesting. We have tons of Asian greens right now that I’m trying to find a use for, and I think they would substitute well for the spinach. But, is it too weird to use Komatsuna with mimolette? I’ll have to think on that one. Happy holidays! Mimolette is hard to find in the US, very true… glad you found some and made such a lovely dish with it – it add some beautiful sparks of color! Silvia, I think the luckiest person in the world should be your boyfriend!haha…. He can eat all the food you cook everyday! This sounds sounds incredible and I love orzo. Have never had mimolette but now I must find it! This looks delicious, and I’ve never had mimolette before. I love trying new ingredients!